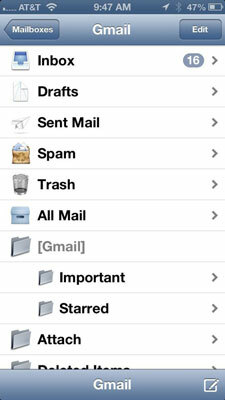 To get your mail messages on your iPhone, tap the Mail icon to summon the Mailboxes screen. At the top of the Inboxes section is the All Inboxes inbox, which as its name suggests is a repository for all the messages across all your accounts. The number to the right of All Inboxes should match the number in the Mail icon on your Home page. (If it doesn’t, some fuzzy math is going on.) Again, it’s the cumulative tally of unread messages across all your accounts. Below the All Inboxes listing are the inboxes for your individual e-mail accounts. The tally this time is only for the unread messages in each account. Scroll down toward the bottom of the Mailboxes screen and you’ll find an Accounts section with a similar listing of e-mail accounts. But if you tap on the listings here, you’ll see any subfolders for each individual account (Drafts, Sent Mail, Trash, and so on). You can add new mailboxes by tapping Mailboxes→Edit→New Mailbox — if your e-mail provider allows you to add (and for that matter, delete) mailboxes. Not all do. Choose a name and location for the new mailbox. Or tap an existing mailbox, and then tap Delete Mailbox to get rid of it (and all its contents). To read your mail, tap an inbox: either All Inboxes to examine all your messages in one unified view or an individual account to check out messages from just that account. 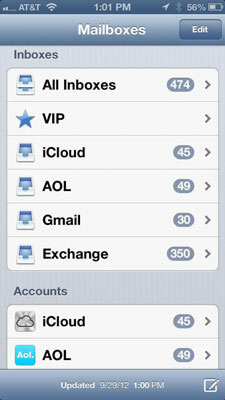 If you have just a single mail account configured on your iPhone, you’ll see only that one inbox on the Mailboxes screen. When you tap a mailbox to open it, Mail fetches the most recent messages and displays the total number of unread messages at the top of the screen. Now tap a message to read it. When a message is on the screen, buttons for managing incoming messages appear below it.